Mitchell Joseph Mulholland was the youngest son of Michael and Mary Mulholland. 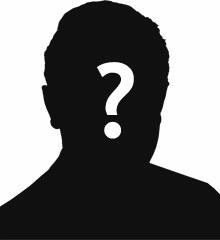 He was born in Coalisland, Co. Tyrone. His father, Michael Mulholland, was a ‘Flax Spinning Overlooker’. The family moved around Ireland a lot. Mitchell Mulholland was educated at Halifax Secondary School, where he won the Rawson Shaw Scholarship, and St. Mary's R.C. College, Hammersmith. Mitchell Mulholland enlisted in 1915. 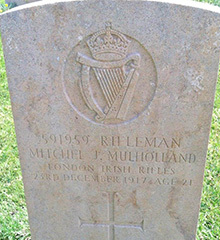 Rifleman Mitchell Mulholland served in France and Macedonia. Rifleman Mulholland was serving with 2nd/18th Battalion of the London Regiment (London Irish Rifles) when he was killed in action on Sunday 23rd December 1917 in Palestine. He was 21 years old.